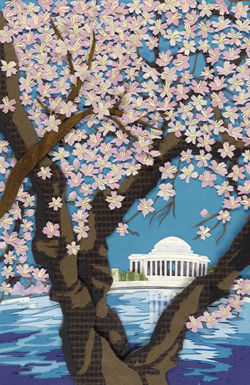 The National Cherry Blossom Festival has announced that the 2010 Festival Artwork has been selected. The piece (seen above) was created by Junko Yamada of Jackson Heights, NY. The artwork will be seen on official merchandise when the National Cherry Blossom Festival arrives on March 27 and concludes on April 11. Grandstand ticket seating for the parade is already on sale for those who can’t wait. Also of note is a new collectible holiday ornament, hand-painted by artist Otella Brantmier. Just a little touch of spring for those of you already chilled by winter. It’s beautiful. What a nice reminder that we will see spring again in DC! I’m also from Jackson Heights, so that’s fun too!